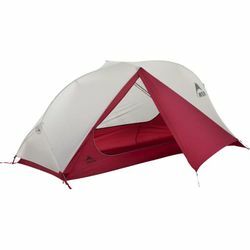 MSR Freelite 1 Ultralight Backpacking Tent. Updated for 2019. Designed for backpackers and adventurers who want to make the most of their time outdoors, the FreeLite™ 1 offers the comfort of a backpacking tent in an ultralight design that won’t weigh you down or take up much room in your pack. With its unified freestanding frame, it sets up quickly to offer soloists plenty of headroom—great for sitting up and planning the next day's adventure, whether it’s hiking the Tahoe Rim Trail, mountain biking the Flume Trail, or sport climbing on the South shore. The ventilating micromesh canopy and large, easy-access door are just a few of this liberating tent's livable features that make you feel free to tackle it all. Ultralight: MSR's lightest semi-freestanding, double-wall solo tent provides full protection without a big weight penalty. Easton® Syclone™ Poles: Made of aerospace composite materials, Syclone poles resist breaking in fierce winds, boosting the reliability of your tent. Easy Access: Large door offers access to spacious interior for comfort and convenience on longer backcountry trips. Ventilation: Micromesh canopy offers maximum ventilation, moisture control and bug-free protection. Weather Protection: Xtreme Shield™ waterproof-coated rainfly and floor.